Having spent my university years in Edinburgh going back always feels like coming home. Except during the Fringe and then it still feels like coming home but coming home at Christmas when the house is jam packed with extended family, rammed with other people's presents and you're so far down the pecking order that you're lucky if you get a couch to sleep on. For our Fringe debut we borrowed this caravan. So our living quarters were small but our plans were big. We were doing our show everyday for 9 days come rain, or rain or more rain (It was Scotland we were under no illusions) and our show would be in support of the Edinburgh Children's hospital Charity. A charity we were very much inspired by with their ethos of making sure the kids they work with feel like a child first and a patient second. It was an amazing 10 days, we worked with some fantastically creative children, were inspired by some great shows, I met Una Stubbs (and made a bit of a fool of myself telling her how wonderful she is) but our last day was the day that really stands out. 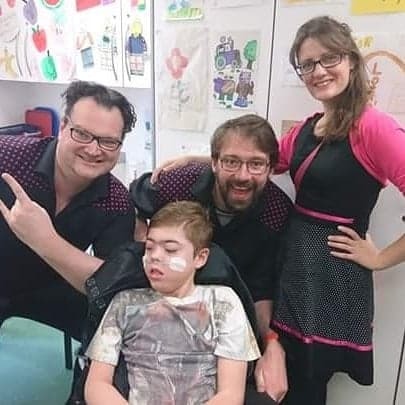 That was the day we got to perform on the wards of the Edinburgh Children's Hospital and take them the money we'd raised. There we met the wonderful Fiona, an absolute gem of creative energy, kindness and determination. The kind of person that charities can't run without. She took us round the wards to perform one on one sessions with some of the children and every story was as different as the child we were performing for. It was a humbling, inspiring experience and one I hope that we can recreate again for local children's hospitals and care centres around Yorkshire. Fiona told me afterwards that she'd been approached by lots of theatre groups who wanted to perform in the hospital during the Fringe but that we were the only ones she'd said yes to. What an honour! But I think I understand why that might be. With a lot of shows, even kids shows, they're about the performers first and the audience second. But how we work, building a show around our audience and ensuring everything we do is in service of their ideas, their creativity, their wants and their needs makes for a show that can be taken into any environment, work with any children and nurture them rather than a performers ego! So all in all I'm calling our first Edinburgh fringe a huge success! We may not have had the big audiences I'd hoped for but I can't wait to go back next year because what we did take away and the friendships we made at this years Edinburgh festival were far more valuable than any big crowd. Newer PostAnything Could Happen at your Birthday Party!